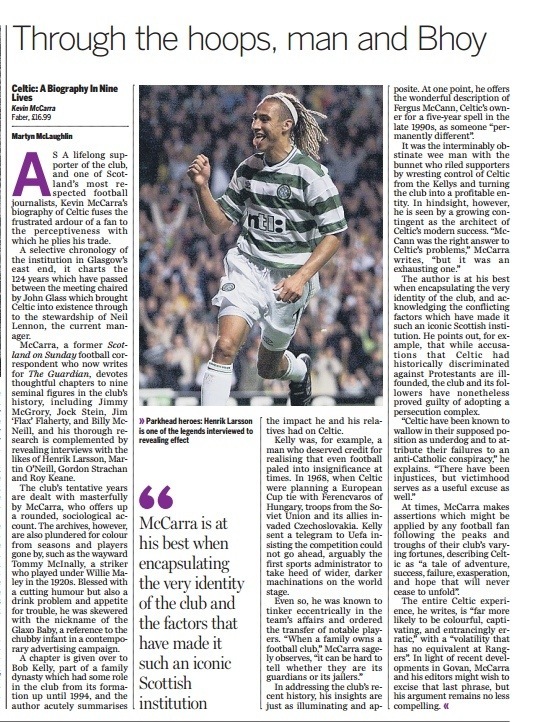 AS A lifelong supporter of the club, and one of Scotland’s most respected football journalists, Kevin McCarra’s biography of Celtic fuses the frustrated ardour of a fan to the perceptiveness with which he plies his trade. A selective chronology of the institution in Glasgow’s east end, it charts the 124 years which have passed between the meeting chaired by John Glass which brought Celtic into existence through to the stewardship of Neil Lennon, the current manager. McCarra, a former Scotland on Sunday football correspondent who now writes for The Guardian, devotes thoughtful chapters to nine seminal figures in the club’s history, including Jimmy McGrory, Jock Stein, Jim ‘Flax’ Flaherty, and Billy McNeill, and his thorough research is complemented by revealing interviews with the likes of Henrik Larsson, Martin O’Neill and Gordon Strachan. The club’s tentative years are dealt with masterfully by McCarra, who offers up a rounded, sociological account. The archives, however, are also plundered for colour from seasons and players gone by, such as the wayward Tommy McInally, a striker who played under Willie Maley in the 1920s. Blessed with a cutting humour but also a drink problem and appetite for trouble, he was skewered with the nickname of the Glaxo Baby, a reference to the chubby infant in a contemporary advertising campaign. A chapter is given over to Bob Kelly, part of a family dynasty which had some role in the club from its formation up until 1994, and the author acutely summarises the impact he and his relatives had on Celtic. Kelly was, for example, a man who deserved credit for realising that even football paled into insignificance at times. In 1968, when Celtic were planning a European Cup tie with Ferencvaros of Hungary, troops from the Soviet Union and its allies invaded Czechoslovakia. Kelly sent a telegram to Uefa insisting the competition could not go ahead, arguably the first sports administrator to take heed of wider, darker machinations on the world stage. In addressing the club’s recent history, his insights are just as illuminating and apposite. At one point, he offers the wonderful description of Fergus McCann, Celtic’s owner for a five-year spell in the late 1990s, as someone “permanently different”. The author is at his best when encapsulating the very identity of the club, and acknowledging the conflicting factors which have made it such an iconic Scottish institution. He points out, for example, that while accusations that Celtic had historically discriminated against Protestants are ill-founded, the club and its followers have nonetheless proved guilty of adopting a persecution complex. At times, McCarra makes assertions which might be applied by any football fan following the peaks and troughs of their club’s varying fortunes, describing Celtic as “a tale of adventure, success, failure, exasperation, and hope that will never cease to unfold”. The entire Celtic experience, he writes, is “far more likely to be colourful, captivating, and entrancingly erratic,” with a “volatility that has no equivalent at Rangers”. In light of recent developments in Govan, McCarra and his editors might wish to excise that last phrase, but his argument remains no less compelling.